Last Friday, Results Japan staff, some community members and county casual volunteers collaborated in a clean-up and drain clearing activity. The clean-up comes at a time that rains are expected, which most of the times wreak havoc due to dirt filled waterways, and washing away dirt into rivers. The clean-up focused on these areas and removed a huge amount of dirt, which made the area appear much cleaner than before. Thus the clean-up came at a most opportune time. 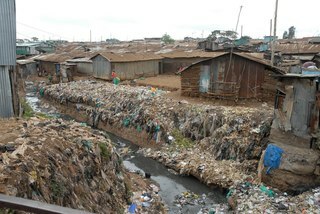 The sorry state of drainage and garbage in Nairobi has been a perennial problem that both the national and county governments have failed to fix for decades. Kangemi area does not have a sewer line, whereas some parts of the city still use drainage and sewer lines that were constructed during colonial rule in the 1950s and early 60s. The county is still having major problems to collect and clean such neighbourhoods. The rising number of people also means more garbage production, further compounding the problem. Encouraging the Kangemi people to have such clean-up activities by themselves is highly encouraged, and this is the best way to ensure sustainability. However, since they do not have that mindset, for now, having a by-law by Nairobi City County to ensure everyone does mandatory cleaning of the area of his home or business is needed very soon. We hope this suggestion materializes and makes it possible for a clean Kangemi.